Welcome to another edition of the WNR. It was another slow news week, and so this is going to be another short one. Some of you are probably too busy watching the World Cup to worry about copyright issues, or how streaming is taking over everything. I get it, and I would be too, if the time differences were a little kinder for those of us here in Australia. 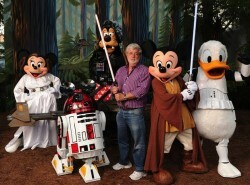 Disney’s bid to buy Fox’s film and TV business now has some serious competition in the form of a rival bid from Comcast. The telecommunication company has to react to rival AT&T’s takeover of Time Warner, which took place last week and was quickly followed by the launch of AT&T’s streaming product, WatchTV. Comcast’s bid put pressure on Disney to up their earlier offer, and this they did too, now offering more cash on top of their original stock only offer. Throughout all of this, Fox has always said they prefer to do business with Disney and the new offer cements this believe. Disney wants Fox not only to re-unite its Marvel properties (not to mention the distribution rights to the original Star Wars trilogy with the rest of the franchise), but may also needs Fox’s content for its own streaming product to be launched next year. When that happens, the new yet unnamed streaming platform will be more akin to Netflix than AT&T’s WatchTV, which focuses more on live streaming of TV channels, some of which are now owned by AT&T (including CNN, TBS and TNT). And with both Disney and Fox’s library of content, the new streaming service will offer some serious competition to Netflix. Fox shareholders will hold a special meeting on July 10 to vote on the potential merger. Sorry about the brief hiatus last week, but in the WNR’s stead, I hope you enjoyed reading the (really really delayed) Blu-ray: The State of Play article. As the preview for the article mentioned, there were no real surprises, with Blu-ray (and DVD) continuing their slide towards VHS. No need to skip anything this week though, as we do have a bit of news to go through. Skipping straight to digital video news, streaming and the world of politics intersected this week when a campaign to boycott Netflix sprang up in response to an announcement by the streaming giant that angered the US conservatives community. 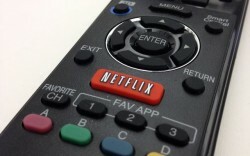 Netflix announced that a new deal was struck with a production company linked to the Obamas, which along with the recent appointment of former Obama admin advisor Susan Rice to its board of director, had caught the ire of conservatives, now accusing Netflix of having a liberal bias. Polling conducted by YouGov did find a serious slide (of 16%) in Netflix’s favorability rating among conservatives (unsurprisingly, they also found a 15% rise in favorability among liberals), but Netflix remains one of the most liked networks in the US (second only to the Discovery network), even among self identified Republicans. Like many critics have concluded, Netflix’s move has very little to do with politics, but very much to do with business (like any good corporation). The Obamas are popular in many of the markets that Netflix are trying to grow, and so business trumps (pun unintended) any real or perceived political bias. 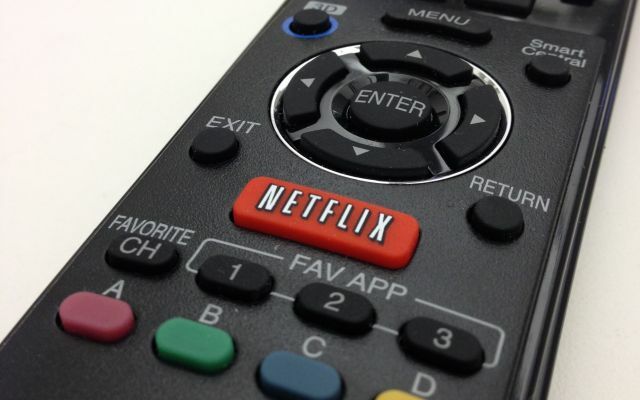 For those that haven’t cancelled their Netflix subscriptions yet, they are increasingly watching Netflix and other media via their streaming media devices such as the Apple TV or Roku, as opposed to using their smart TV to do so, according to new data released by Parks Associates. 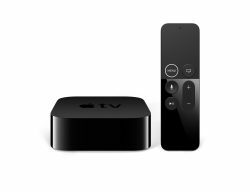 In fact, 50% of people who have smart TVs also down a streaming media device that probably duplicates many of the functions they already have on their TV. For anyone who has used both types of devices, this shouldn’t come as a surprise. Smart TVs often have cumbersome interfaces that makes little effort to be user friendly, and have apps that aren’t updated frequently enough to take advantage of the latest features of services such as Netflix. There’s nothing “smart” about many of the set ups on these so called smart TVs, with many of the features merely an afterthought and it’s more for marketing reasons than anything else that these features exist. 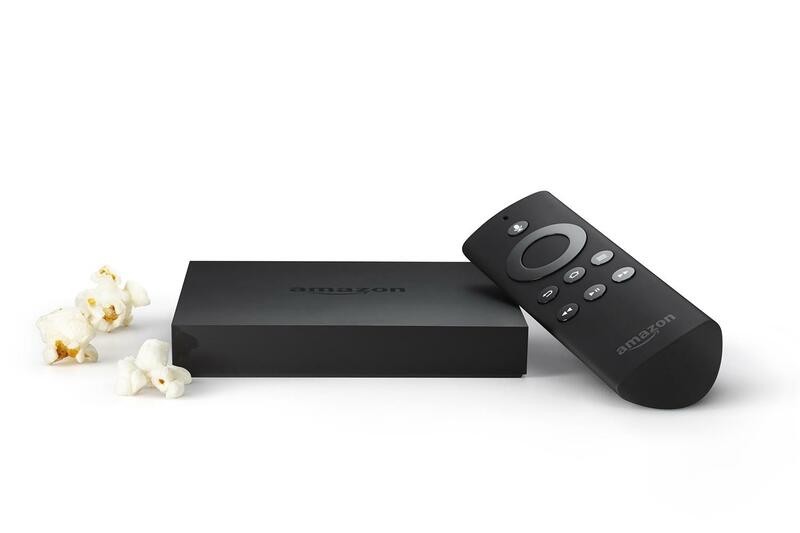 The Parks data also pointed to a small decline in Google’s share of the streaming media device market, with Amazon filling the void. The Chromecast, as good as it is, is also limited in the number of supported apps and in terms of usability (relying on your smartphone/tablet app in order to provide much of the usability, leading to a lack of a coherent and consistent interface between services). Other data shows the adoption of 4K/Ultra HD television sets is gathering pace, with 30% of TV purchasers now going for the 4K type over the standard HD ones. Again, not too surprising considering the sometimes small price premium between HD and UHD models. And unsurprisingly, we’ve come to the end of another (short) WNR. See you next week! The data used in this analysis derives from our weekly updates, based on figures released by Media Play News (previously known as Home Media Magazine). Some of the historical figures you’ll see have also been adjusted, due to slight tweaking of the metrics used by MPN to create these sets of data, although the changes have been very subtle and does not change the bigger picture in any way. 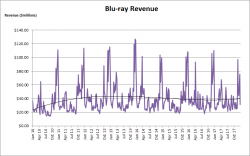 The conclusion from last year’s report centered on the fact that while Blu-ray revenue made a slight recovery off the launch of 4K Ultra HD and the better caliber of releases from 2016, Blu-ray revenue’s peak seems to have been reached in 2013. Read on to find out if this is still true, or if UHD has helped Blu-ray turn a corner! 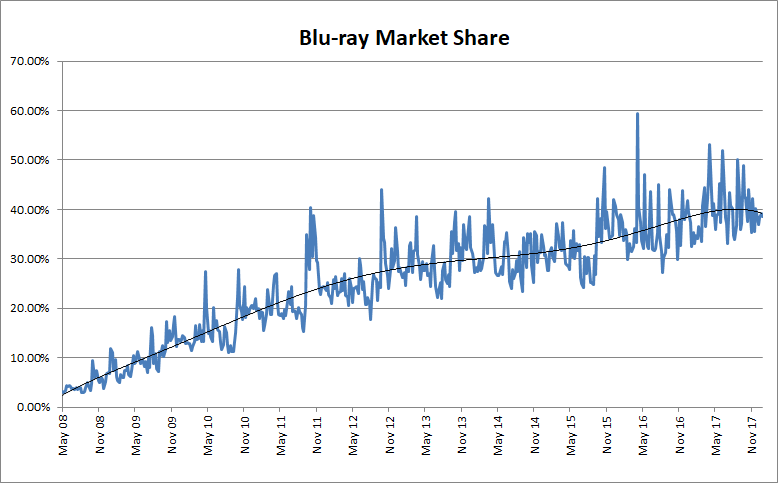 As has been the case with all of our “Blu-ray: The State of Play” reports in the past, we start with the ever wider Blu-ray Market Share graph. 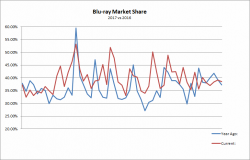 Blu-ray market share represents weekly Blu-ray sales as a percentage of total packaged disc sales. So a Blu-ray market share of 45% means that 45% of all disc packages sold in that week contained a Blu-ray disc (inversely, this also means that 55% of disc packages sold only contained the DVD version of the content). With the way sales figures are reported, any edition that includes a Blu-ray version of the film is counted as a Blu-ray package (even if the package also contains a DVD version of the film). 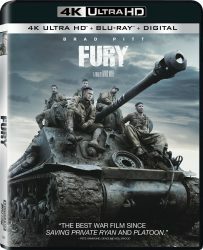 Ultra HD Blu-ray sales are also counted in the Blu-ray column. In the graph below, we also point out some of the more obvious milestone releases. 2017’s major releases, at least those that had a significant impact on Blu-ray market share for the week that they were released, were Moana, Rogue One, Logan, Beauty and the Beast, The Fate of the Furious, Guardians of the Galaxy Vol. 2, Wonder Woman, Spider-Man: Homecoming and Cars 3. Below is the same data condensed and with a trend line added. The trend line does seem to indicate some kind of flattening for most part of 2017, and certainly the peak recorded in 2016 (for ‘Star Wars: The Force Awakens’) was not bested in 2017, although there were a few smaller peaks that, had it not been for the record breaking week in 2016, would themselves have been record breaking. The standout releases were ‘Rogue One’ and ‘Beauty and the Beast’, both of these did much better on Blu-ray than your typical release, hence the peaks in the graph. For actual revenue, unfortunately, no records were broken as you can see from the graph below. In fact, none of 2017’s releases managed to beat 2017’s The Force Awakens, and even the important Black Friday/Cyber Monday and holiday sales weeks were lower in 2017 than compared to the same week in 2016. 2017’s peaks were also somewhat lower than even 2015’s, but the record remains with 2013 (and may always be the case). 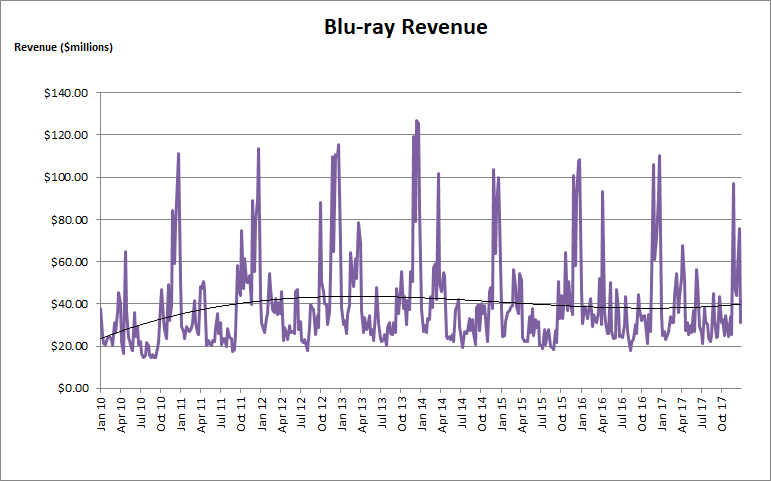 2013 being the peak Blu-ray year, at least when it comes to revenue, remains a likely fact for the foreseeable future – it’s not so much that disc sales were so much higher, but that discs costs less per unit than they did in 2013 – so more sales could still mean less revenue. 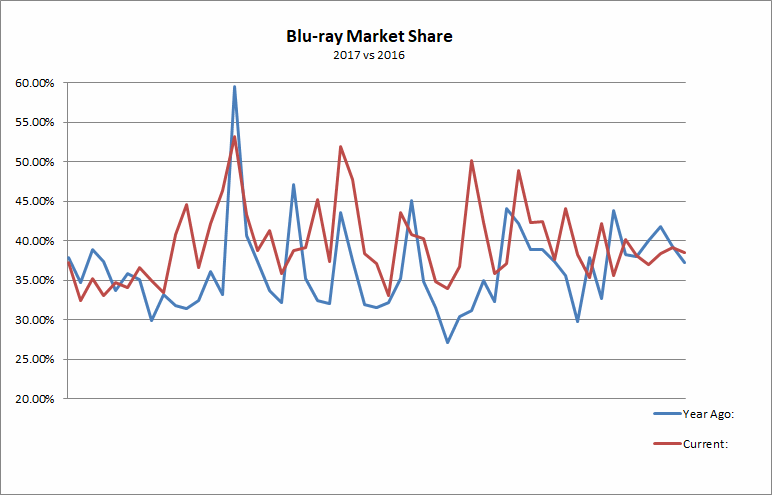 So let’s take a closer look at how 2017 did compared to 2016, starting with Blu-ray market share as shown in the graph below. Overall, it looks like 2017’s market share was, in most weeks, better than 2016’s. 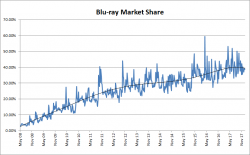 This may have more to do with the decline in DVD revenue being faster than the decline in Blu-ray revenue, which causes Blu-ray market share to naturally rise. Revenue wise, the differences between 2016 and 2017 were less visible. It was mostly an up and down affair, with some weeks being higher, some being lower, although 2017 really failed to hit the peaks that 2016 did, especially towards the important end of the year holiday sales period. We can get a clearer picture by looking at the raw numbers. Out of the 52 reporting weeks in 2017, 23 of them were better than the same week in 2016, with 29 being worse. This is almost a complete reversal of 2016, and is actually more similar to 2015, when 31 weeks had a weekly revenue worse than the same week in 2014. 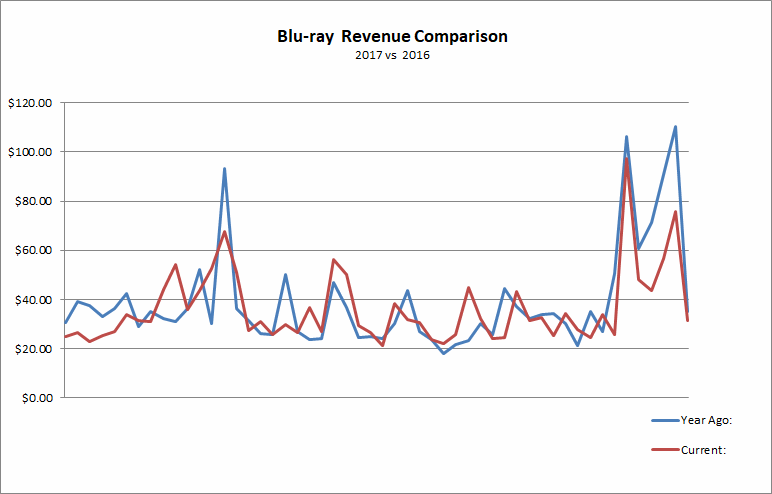 It appears that without record breaking huge releases, Blu-ray is definitely experiencing a steady decline. Average Blu-ray market share was 39.6% in 2017 compared to 36.36% in 2016. 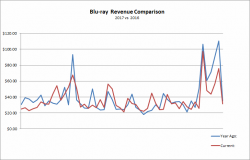 As a result, Blu-ray revenue continued the decline first seen in 2014. Total Blu-ray revenue for 2017 was $1.88 billion, compared to $2.02 billion in 2016, a decline of 6.74%. These results still seem to confirm that 2013 was the peak for Blu-ray sales, and that the “Rey” of hope for in 2016 may have been just a temporary one. There are some bigger releases in 2018, including The Last Jedi, the latest Avengers movie and surprise mega-hit Black Panther, but even these may not be enough to slow or stop Blu-ray’s decline.